I spent the afternoon at the opening for the Northern Exposure show at the Spirit Wrestler Gallery. This is an annual show for the Freda Diesing School of Northwest Art, featuring the graduating class and the pick of the work by first year students. Besides giving students some extra cash, the show also teaches students how to deal with a gallery and an exhibition. So, naturally, when I was talking to the students, a common topic was whether they should try to place more pieces in galleries or find other ways to make a living from their art. The question, I found, is hard to answer in the abstract. Not only does the answer depend on the galleries involved, but I suspect that the details of the answer are starting to change. On the one hand, a gallery that is enthusiastic about an artists’ work can be the best advertising that the artist can have. The gallery staff can draw visitors’ attention to the artist to increase their sales. The gallery can act as an unofficial agent, passing commissions on to the artist. I’ve heard of gallery owners advising artists about what is selling, and the prices that buyers are willing to pay. They can promote an artist in a group show – or, better yet, a solo show. Artists can’t expect a gallery to promise to buy regularly (“That would mean we were taking on responsibility for an artist earning a living,” one gallery employee remarked to me), but an unofficial agreement that an artist will give a gallery first right of refusal for new works can benefit everyone. On the other hand, horror stories about galleries are common. I have on good – but strictly anonymous – authority that certain gallery owners regularly break verbal agreements, all the while insisting that written contracts aren’t necessary. Some, too, delay payment for months; in one case I know about, the artist had to wait ten months for over ten thousand dollars. Artists who ask about such delays have had gallery owners scream abuse at them. However, regardless of how a gallery treats artists, all of them have one thing in common: They stand between artists and their audience. This relation has the advantage of freeing artists from having to promote themselves. But it also means that 40-60% of the total price of a piece goes to the gallery. Considering that literary agents charge 15-20% for the same services, artists may feel that the price is too high, no matter how good the services are. Fortunately, for artists who feel that way, the Internet provides some alternatives. Websites, Facebook fan pages, and microblogs like Twitter all provide ways for artists to interact directly with their audiences, bypassing the galleries entirely, if they choose. With free software content management systems like Joomla! or Drupal, artists can even conduct online auctions, using Paypal or credit card services for payment. As for pricing, artists can charge more than the wholesale price they receive and still offer prices that are lower than a gallery would charge. And, increasingly, artists are taking full advantage of these alternatives. 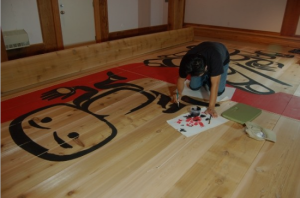 One senior First Nations artist says that 80% of his sales come from the Internet. Another estimates that about one-third of his sales are online, and is trying to boost that fraction every way he can. But artists pay a price when taking control of their sales in this way. They have to learn marketing skills, which can make them nervous and uncomfortable if they are inexperienced or introverted. They have to learn the principles of commercial design, which are very different from the art they create. They not only have to create their initial web pages or Facebook pages, but keep them constantly replenished with new content, because nothing looks less professional than a long outdated web presence. If buyers are unsatisfied, they have to deal with the problem themselves. Most important of all, they either have to spend time on business and promotion – perhaps as much as a third of their working hours, especially at first – or find a sympathetic friend or family member or maybe a consultant to do the work for them. With these demands, some artists might feel that the price for taking full control of their career is too high. Yet another problem is that an artist can make a living promoting themselves, but, in doing so, they become invisible to the traditional art market. If that happens, then the artists may not be mentioned in art books, or approached by governments and other institutions for large commissions. My own suspicion is that, despite the disadvantages, an increasing number of artists will start to market themselves. 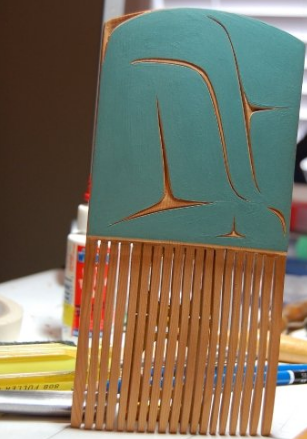 Most Northwest Coast artists I know are doing some online promotion, although none (so far as I know) are doing all they could. In the future, galleries will continue to exist, but they may have less control over artists than they have traditionally had, because the alternatives will be too well-known. Whatever happens, artists today have a choice that they didn’t have fifteen years ago. However, what choices they should make depends very much on their own skills, personality, and preferences. 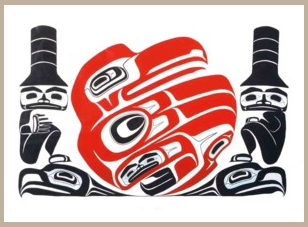 As part of my recently renewed interest in Northwest coast art, I’ve been making the rounds of the local galleries, trying to get a sense of their specialties and whether I want to deal with them. This afternoon, I made the rounds of the Gastown galleries, which are conveniently within a few blocks of each other. Hill’s Native Art: Coming from the Skytrain, this was the first gallery I came to, and also the one I spent the least time in. It’s basically a high-end tourist shop, and so crowded that the main impression I took away was of art as a commodity. You could probably find some reasonably decent work if you searched, but, you would have to make an effort. Hill’s has a number of two or three meter high totem poles, but if you’re willing to spend over ten thousand, you would be better off spending a little more and buying one from a name artist elsewhere. Spirit Wrestler Gallery: With over two decades of experience and a number of well-regarded shows and books behind it, Spirit Wrestler is at the opposite extreme from Hill’s, appealing to the serious collector with money to invest in art. Its selection of artists is small, but carefully chosen, and it has a varied selection of work from top artists such as Robert Davidson, Norman Tait, and Susan Point. Currently, it has more Tlingit work than any other gallery that I’ve seen, and a small but select collection of bracelets. The gallery also sells (but does not always display) pieces that have just come upon the market again, so a serious collector might want to keep in touch to hear what is available. 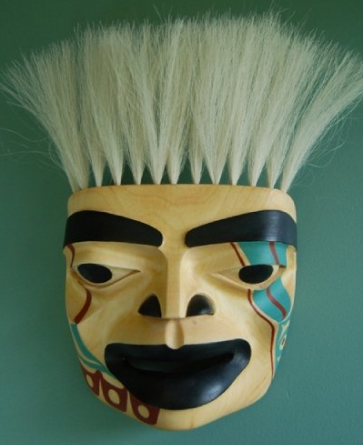 The gallery also contains a few Maori works, which should interest many people who have a passion for Northwest Coast art, since the two cultures have a lot of similarities. It’s perhaps the premier gallery in the field in Vancouver, and deservedly so. 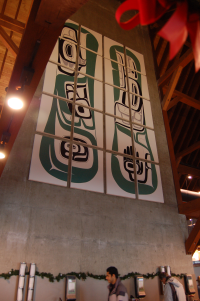 Inuit Gallery of Vancouver: This gallery has no more than a fifth of its space devoted to Northwest Coast art. 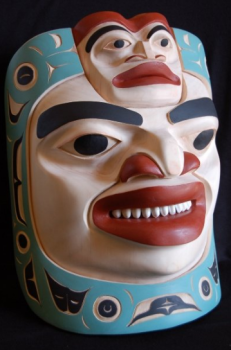 It does not carry jewelry, but does include a collection of Northwest Coast masks and prints, as well as some other forms of carving mostly from the Nuu-chah-nulth and Salish nations. Although the selection of artists is comparatively small, you can find some interesting pieces without searching hard. Coastal Peoples Gallery: In many ways, Coastal Peoples is the most interesting of the galleries in Vancouver. In both its Yaletown and Gastown locations, it carries everything from high-end tourist pieces to work that will appeal to museums and connoisseurs. To make things even more interesting, Coastal Peoples has by far the broadest range of artists of the four galleries mentioned here, with up-and-coming artists as well as established ones represented. The newer artists are especially interesting if you have any understanding of what you are buying, because their work is reasonably priced and some of it will undoubtedly rise rapidly in value. The jewelry on display is especially fine, especially in gold, and so is the sculpture, including everything from desktop pieces to bentwood boxes and three meter poles. The sheer variety at Coastal People’s is amazing, and is one of the reasons why the gallery is my current favorite. 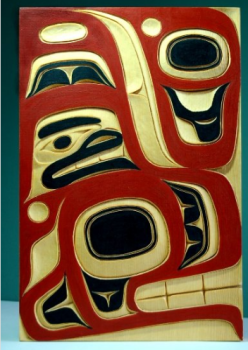 There are, of course, other galleries that carry Northwest Coast art outside of Gastown in Vancouver. But they will be a subject for another day.